William Torrey : Surf-Board Riding, Waikiki, 1837. Press of A. J. Wright, Boston,1848. After sailing to Peru, the Galapagos, the Society Islands (Tahiti) and Japan, the Huntress returned to the Sandwich Islands in April and departed from Honolulu in August 1837. AS well as his detailed description of surf-riding at Waikiki, Torrey was aboard one of several longboats that towed the Potomac from Honolulu harbour to gain the wind, and on their return some thought to try the surf (in the manner of the local outrigger canoes), but several boats were upset, and the men were thrown upon the reef, and much bruised. the Brig Doll, Capt. -------, of Otaheite, of which wreck himself, and one shipmate, can alone tell the sad tale. Also, for many years served in the several capacities requisite for seamen, on both English and American Merchants' ships. 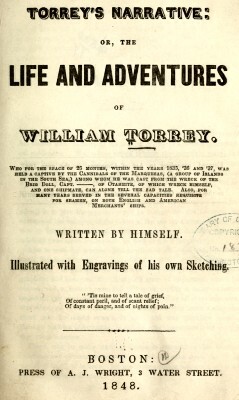 Illustrated with Engravings of his own Sketches. When the Potomac left the harbor, she was towed by a number of boats within the influence of the sea breeze, when, giving three cheers which were answered, she made sail, and was soon out of sight. On our return to the harbor, some thought to try the surf, which is sometimes performed in canoes, but usually on what is termed a surf-board, which is an article of private property among the higher classes, both male and female, and to some extent among the common people. to twenty inches wide, rounded down to an edge; the whole surface being made very smooth. With this under the arm, they repair to the water, and swim into the surf. As they meet a roller, as it is called, or wave, they plunge beneath, and let it pass over. and headed for the shore. They skillfully keep themselves upon the swell with their feet and arms, and are borne with the greatest velocity upon its foaming crest, with their heads alone visible above the foam. As they near the shore, they usually slip from the board, to prevent being thrown upon the sand by the surf. break high above the coral reefs. Four or five of the boats in trying it upset, and the men were thrown upon the reef, and much bruised. We left the harbor of Honolulu about the first of August, 1837, bound for the coast of California. Geoff Cater (2017) : William Torrey : Surf-Board Riding, Waikiki, 1837.